When I think about FLAVOR—dance-on-your-tongue, wow-your-mouth, never-let-it-end FLAVOR—few dishes capture the experience more completely than chicken mole. Rich, complex, and lightly smoky, mole sauce is traditional in Mexican cooking and can transform even the most basic ingredient (shredded chicken, I am looking at you) into something extraordinary. Real-deal authentic chicken mole sauce takes days and 20+ ingredients to make. It’s a treat to devour (I love ordering it when we go out for Mexican food) and something I hope to cook the old-school way someday. Anyone want to spend a day sipping a Skinny Margarita or two and teaching me? Since most nights I hardly have an hour (let alone days) to make dinner, I set out to see if I could create an easy chicken mole recipe that delivers the complex, bewitching flavor that makes mole so characteristically spell binding, but in a fraction of the time with one-third of the ingredients. Where Mexican food is on the line, I will not be deterred. Say hello to Instant Pot Chicken Mole! Let’s be clear: this is a cheater, streamlined, easy chicken mole recipe. It might not be 100% traditionalist approved—or even 80%—but it is unquestionably delicious and maintains the slightly sweet, smoky, and seductive flavor of authentic chicken mole. My two shortcut secrets: the Instant Pot (this is the model I own and love) and an essentials-only ingredient list. Why the Instant Pot for Chicken Mole? Ever since I started cooking these Instant Pot Shredded Chicken Tacos, the pressure cooker has become my favorite way to make shredded chicken (this Instant Pot Teriyaki Chicken included), along with other favorite Mexican recipes like this Instant Pot Mexican Casserole. The chicken comes out perfectly tender and juicy, it’s easy to shred on the spot, and you only have one pot to wash in the end. The nature of mole sauce itself also makes it a prime pressure cooker candidate. The Instant Pot concentrates the sauce’s flavors more rapidly, speeding up the cooking process. The fact that the chicken cooks in the Instant Pot at the same time as the sauce saves an extra step too! 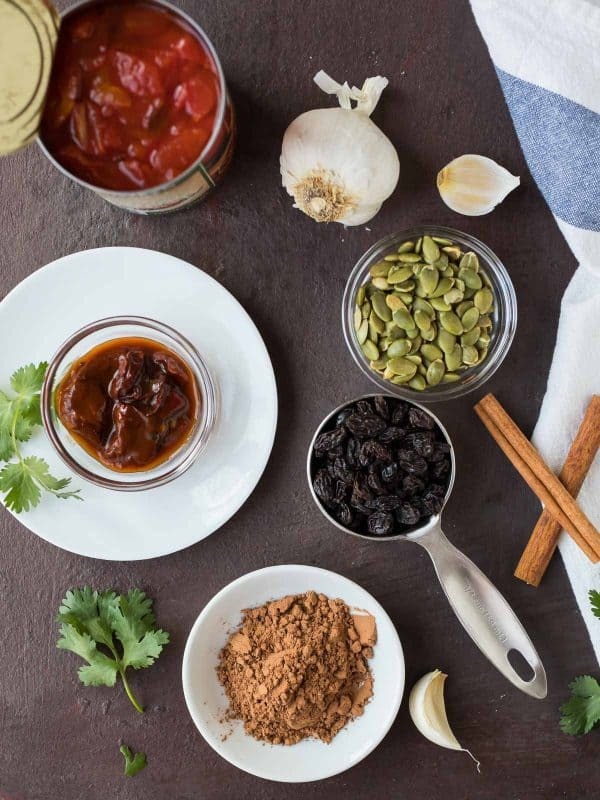 What Are the Ingredients in Mole Sauce? I kept the essentials, the ones mole sauce wouldn’t taste complete without—nuts, raisins, cinnamon, cumin, and chocolate (yes, chocolate! It’s the secret to mole’s inexplicably deep flavor)—then combined them with a few “super” ingredients that have a whopping amount of flavor on their own. The most important of the super ingredients is canned chipotle peppers in adobo sauce. I’m hooked on these rich, smoky peppers and often use them to impart mega flavor with minimal effort. Many mole sauce recipes call for a blend of three or four different peppers. For today, I’m quite happy to stick with my one-ingredient wonder. You can find chipotle peppers in the Hispanic aisle of most grocery stores and even online. You’ll have a few peppers left over in the can, which you can enjoy in any one of these recipes. Arrange the chicken in the Instant Pot. Place the sauce ingredients into a blender, process until smooth, then pour the whole shebang right over the chicken. Note: It will smell amazing. Cook the chicken for a short and sweet 8 minutes of pressure. It will be incredibly moist and tender and soak up the wonderful flavors of the sauce. Remove the chicken and set it aside. Reduce the sauce right in the Instant Pot on the saute setting. (Be careful! It splatters.) Shred the chicken. Add the chicken back into the sauce, stir, and ta-da! Seriously legit-tasting shredded chicken mole you can use any way you like. If you’d like to make chicken mole in the slow cooker, this isn’t something I’ve tried myself, but I did add suggestions to the recipe notes. If anyone does make slow cooker chicken mole, please let me know how it goes. 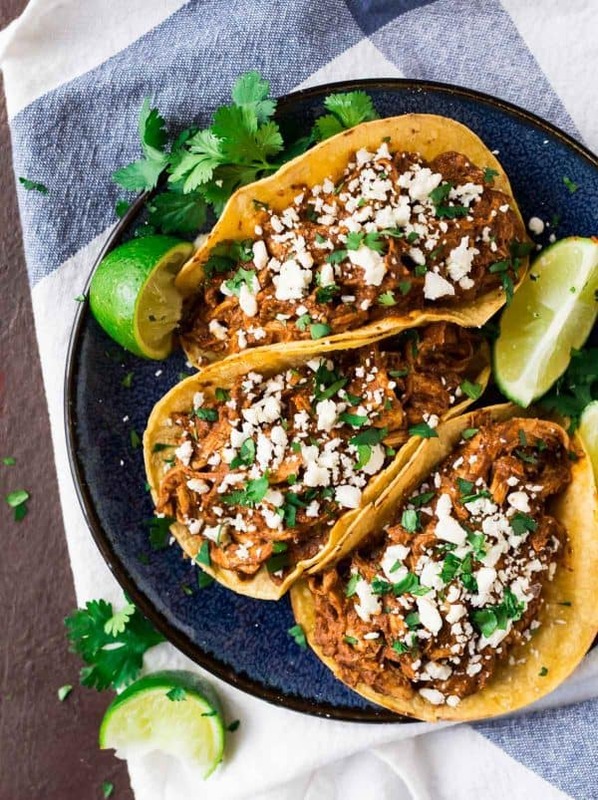 The majority of the time, we use the Instant Pot Shredded Chicken Mole to make always-satisfying mole chicken tacos. My favorite toppings are feta or queso fresco and cilantro. It would be equally tasty as a filling for enchiladas or quesadillas. Sprinkle it over tortilla chips, add cheese, chopped red onion, or any of your other favorite fixins, then pop it into the oven for a few minutes for mole chicken nachos. Devour directly out of the Instant Pot (this happens a lot here too). If you are into Mexican food, bold flavors, and any excuse to open a bag of chips, this easy Instant Pot Chicken Mole will be a sure hit in your house! If you decide to try it, be sure to leave a comment. It makes me so happy to hear from you. 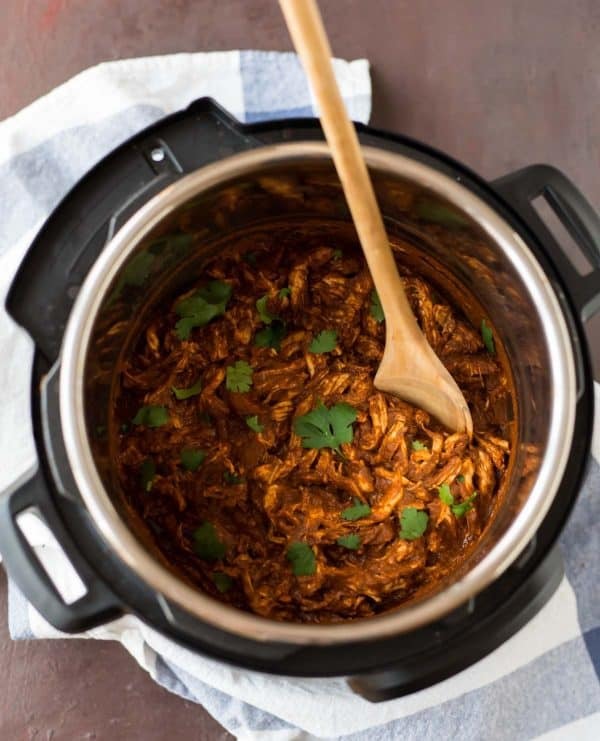 Easy Instant Pot Chicken Mole from scratch! Quick recipe that tastes authentic but is made fast in the Instant Pot. Use this delicious shredded chicken for Mexican enchiladas, tacos, rice, and more. Your favorite toppings: freshly chopped cilantro, avocado, sliced radishes, chopped almonds or pepitas, cheese, etc! Set a 6-quart or larger Instant Pot or similar electric pressure cooker to SAUTE. Add the olive oil. Once hot, add the onion and sauté until softened, about 3 to 4 minutes. Add the garlic and cook just until fragrant, about 30 seconds. Turn off the Instant Pot and scrape the onion and garlic into a blender. Return the insert to the pot and set back to SAUTE. Add a few splashes of water, scrape up any browned bits, and discard them. You want the bottom of the Instant Pot to be fairly clean so that it does not burn. Turn off the Instant Pot. 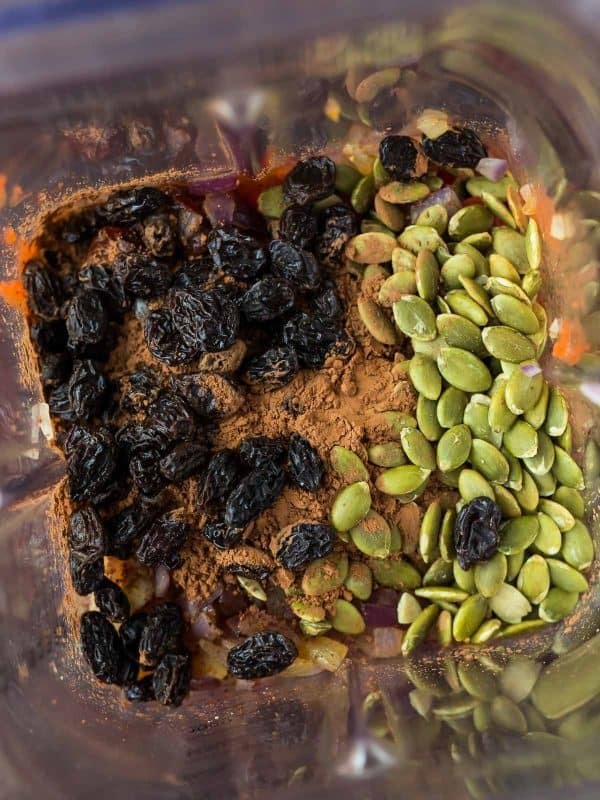 To the blender with the onions, add the tomatoes, chipotle peppers, adobo sauce, pepitas, raisins, cocoa powder, salt, cumin, and cinnamon. Blend until smooth. Lightly coat the Instant Pot with nonstick spray and place the chicken in the Instant Pot. Pour the sauce over the top and do not stir. Cover and seal the Instant Pot. Cook on HIGH pressure for 8 minutes (for chicken breasts) or 10 minutes (for chicken thighs). Vent immediately. Remove the chicken to a plate. Turn the Instant Pot to SAUTE and bring the sauce to a simmer. Let bubble, stirring occasionally, until the sauce is rich and thick, about 10 minutes. Place a layer of paper towels over the top as the sauce cooks to catch any splatters. While the sauce cooks, shred the chicken with two forks. Return the chicken to the pot and toss with the thickened sauce. Enjoy with any desired toppings over rice, as a filling for tacos or quesadillas, over nachos, or right out of the Instant Pot with a fork. To make in a slow cooker: I have not tried this method myself, but if you'd like to adapt the recipe for the crock pot, here's what I would recommend. Saute the onions and garlic in a skillet instead of the Instant Pot and proceed with the rest of step 1 and 2 to make the sauce. Place the chicken and sauce in the slow cooker as directed in step 3 and cook for 1 1/2 to 2 1/2 hours on high or 4 to 5 hours on low. After the chicken is cooked, transfer the sauce to a saucepan to reduce. Can you make this in a Crock-Pot if you don’t have an Instant Pot? Hi Arely, yes, I think you could try it in the crock pot! I would saute the onions on the stovetop before adding them to the crock pot and then reduce the sauce in a saucepan on the stove after the chicken is cooked. I would guess the chicken would take 1 1/2 to 2 1/2 hours on high or 4 to 5 hours on low. If you give it a try, I’d love to know how it goes! Hi Chris, I’ve been getting that question a lot, so I’ve added my best guess on how to adapt this recipe to the slow cooker in the recipe notes below the directions. I hope that helps! I just fell in love. Mole is one of my all time favorite sauces, and when I read Instant Pot I can’t even explain my excitement. How have I never thought of this? I absolutely cannot wait to make this. BTW, I love your site. You have some great recipes and it’s so easy to navigate! 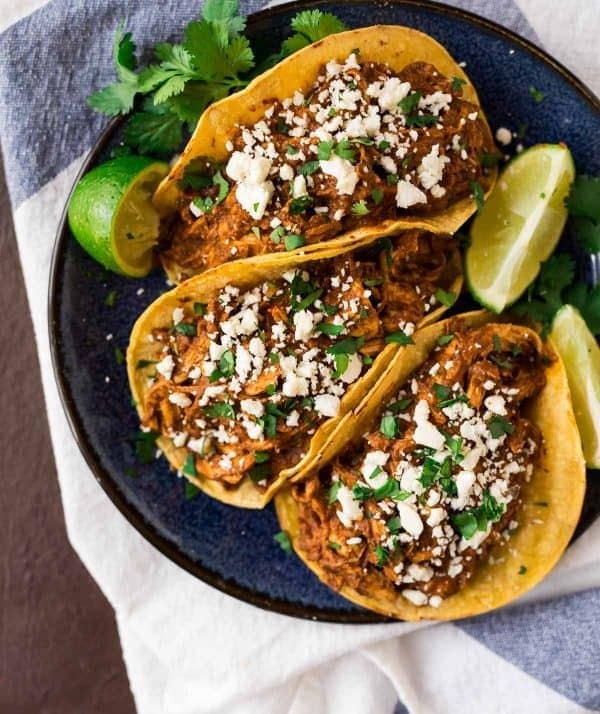 Instant Pot tacos are a major game-changer! We had to double the time in the Instant Pot. We did add about a half a pound more chicken thighs, but when we opened initially they were still raw visibly on the outside. The recipe came out great though, and reheating them throughout the week has been awesome. Haven’t had to add any liquid to keep it from drying out either! Lindsey, I’m so glad you enjoyed the recipe! Thanks so much for taking the time to give it a try and leave your review! I also had to increase the cooking time, but other than that, the recipe was very good! I’m making it again tonight! Thanks for chiming in, Kate! I’m glad you enjoyed it! So so so good- mole in under an hour! Another delicious recipe! Thanks so much for taking the time to make it and leave a review, Jordan! I’m so glad you enjoyed it! Our family loved this chicken mole! Easy to add more or less spice to taste. Served with hot sauce on the table for those that wanted extra kick. Hooray! Thank you so much for taking the time to report back, Erin. I’m so glad it was a hit! I made this but my Instant Pot showed BURN right before it came up to pressure. I got all the browned bits off the bottom. We ended up just slow cooking it. Any thoughts? Hi Fletcher! I’m sorry this happened. Did anything stick and burn to the pot while it was cooking? If this happens, I usually recommend checking the pot to remove anything that is sticking and adding a little more liquid (you could do chicken stock for this recipe and cook the sauce longer at the end to thicken it back up). You can sometimes reseal the pot and continue cooking as long as the burn warning goes away. I’d also suggest reading online to see if you can find more suggestions—since I wasn’t there, it’s hard for me to pin point an exact cause! Erin! Thanks for the response! The sauce seems pretty thick already before we put it back in the Instant Pot. We got all the bits off the bottom as it said in the recipe. We will try adding some more liquid next time. The family ate it tonight on tacos…SO GOOD! Fletcher, I am glad the flavors were spot on for you! Thanks for letting me know how much you enjoyed it! Just made this recipe. It tastes great! Daniel, I’m so happy you loved the flavor! I do find that if you make Instant Pot recipes when the sauce is very thick, that can actually cause a burn warning too. If you like, you could also pour in a little water before adding the chicken, then reduce the sauce further. I hope that helps! Just got finished cooking this and it’s delicious!!!!! YAY JULIE! Thanks for trying it and letting me know! Looks great! I’ve always wanted to make mole sauce, but the recipes are so intimidating. Is it possible to make the sauce without the chicken? How long would it cook in the instant pot? Kim, I’m actually not sure as I’ve never tried. In that case, I would recommend cooking it on the stove top. I made this recipe . I used Chicken Breasts which I cooked for 8 minutes. The chicken was not cooked so now cooking an additional 4 minutes. Hoping this will do the trick! I hope you enjoy, Melissa! Hi Sam, yes, you could try the recipe with regular diced/chopped tomatoes if you’re not able to find fire roasted. And yes, that chipotle paste looks like it would bring a similar flavor to the dish! I hope you enjoy. I keep reading more and more recipes that use a pressure cooker. Will definitely have to purchase one to replace our old one from years ago that we got rid of because of not being able to find a replacement seal. This recipe of yours sounds really good. We do have a crock pot and I think that I will make it in that. I have eaten mole but have never made it so your recipe will be the first. Thanks! I’m excited to try your recipe but I’ve had a jar of mole sauce in the cabinet for a while and figure I should use that first. It’s Do~na Maria Mole 8.25 oz. Wow, I just read the ingredients a lot of non-food ingredients and 170 cal 13 gm of fat for only 2 Tbs. Holy cow, I should probably just throw it out. It does have PB in it and GMO soybean oil (made in Mexico). I thought Mex outlawed GMOs. Can I add PB to your recipe? I understand some people are allergic to PB so maybe that’s why you didn’t add it. Hi Janet, I’ve only tested the recipe as is, but you are certainly welcome to experiment with stirring in a little peanut butter. If you do decide to give it a try, I’d love to know how it comes out. Can you tell me what brand/model instant pot you have? Hi Nancy! I have the 6-quart Instant Pot DUO. I hope you enjoy this recipe if you give it a try! SO. MUCH. FLAVOR. I neeeed it! I need to make these! They look awesome! Your recipe was delicious. It was the best and easiest to make chicken mole sauce I’ve made at home so far. I’m so happy to hear that, Hillary! Thank you so much for taking the time to leave this review too. Boy, this sauce was delicious and the IP made this mole so quick and easy to make! Thanks for taking the time to report back, Liz! I’m happy to hear you enjoyed it! These are on my list, looks so easy! Hi Abigail, you can use whatever large nonstick skillet you have. I hope you enjoy the recipe! Oh this looks sooo good! I might have all the ingredients to make this for lunch today, thank you! I really loved it! Such an amazing meal for weeknights! This recipe cook all of the hard work out of making mole. This recipe is so going into rotation! A perfect mole recipe to frequent. Made this for a small gathering and it got raving reviews. So SOOOO good. I’ve never eaten mole before, so I was curious to try this recipe. I like it so much I’ve now made it twice, and I shared the recipe with several friends. It’s a real winner and very versatile. I was afraid the peppers would be too hot for me, so I used only one instead of two. I was right! One pepper in the recipe is plenty for me. So if you don’t care for spicy foods, try it with one pepper instead of two the first time you make the recipe. Thanks for taking the time to leave this review, Karen! I’m glad to hear you enjoy the recipe! My friend just gave me an Instant Pot and I stumbled across this recipe which is perfect because of my love for chicken mole and mexican food in general. It was the first recipe I tried in the IP and despite a small snafu due to not really understanding how the IP works, it was incredible and I’m obsessed and can’t wait to cook this more and show off to everyone I know! Hooray! I’m glad you enjoyed this, Becca. I hope you find many more Instant Pot favorites! You can Janet! I’m not sure if your thighs are boneless or not—bone-in thighs will need about 15 minutes of high pressure with 10 minutes of natural release; Boneless will cook in 12 to 13 minutes with about 5 minutes of natural release. Check the internal temp to make sure they near 165F (as long as they are above 160, I find that once I let them rest, they hit 165). If your chicken is underdone, just reseal the pot and cook for 2 to 3 more minutes. I’d love to hear how it goes! This recipe was super tasty! I doubled the recipe for 7 people and still had enough for leftovers to feed probably 3 more. I used 5 boneless, skinless chicken breasts. I put them on top of the rack in the instant pot because I read some comments about the chicken burning or sticking to the pot. I also added about 1/2 cup chicken broth to the bottom, before putting the chicken on the rack. I then covered the chicken with the mole sauce and cooked it for 15 min at high pressure (also because I read some comments that 8 min wasn’t enough to cook the chicken all the way thru), and allowed it to naturally release for 10 min. The chicken was cooked, tender and easy to shred. I served it with guacamole, cotija cheese, cilantro, and black beans. This recipe will be repeated at our house, everyone liked it a lot! WHOO HOO Marci! So happy to hear how much you enjoyed it. Thanks for taking time to leave this lovely review! We’ve made this like 6 times now in the last month. So good. The first time I licked all the leftover sauce off the sides of the pot. Like the previous poster, I usually put a little extra liquid (~ 1/2 inch water for me) in the bottom to prevent the “Burn” notice (and/or if cutting chicken off the bone, just layer the bones on the bottom to serve as a rack and add extra flavor), and I blend the sauce with an immersion blender in a measuring cup to save on cleaning a big blender. The recipe doubles well too. Used it for tacos (with some sliced avocado, crumbled queso fresco, and cilantro), enchiladas the next day (here is where it may be helpful to increase sauce proportions so you have some extra sauce), and chilaquiles later in the week with an egg on top. 10 minutes was fine for deboned chicken thighs. Thanks for the life-changing recipe! Thanks for sharing your tips and this wonderful review! I’m happy to hear you enjoyed it! I am new to instant pot this was the 2nd dish I tried to make and it is the 2nd time I got a burn error message. I followed directions even weighed and measured everything. I even washed the pot after Saute. any recommendations on what could be wrong? the sauce was delish! and there was no evidence of anything stuck or burnt at the bottom of the pot. chicken was a little dry for me but again overall great dish full of flavor. UGH, Sandy I am so sorry this happened! The new IP models are so so sensitive and trigger the burn warning super easily. It’s been frustrating for others, and I’m frustrated too as I’ve never had this issue with any recipe on my site. The best option if nothing is stuck and you see “burn” is to add more liquid. If the sauce ends up more liquidy than you would like, you can always cook it down on the stove or using the saute function. You could also add a cornstarch slurry. I’m sorry again for the issues! I usually have all the ingredients on hand for this except the pepitas, so I add a little toasted sesame oil for the nut taste when I make mole. That’s a great tip, Rob! I hope you enjoy! Delicious if you get the cooking time right. For me, it was 20 minutes, and the chicken was not overcooked at all. Nick, I am so pleased to hear this (and I can’t say thanks enough for the glowing review!). I also appreciate the tip on the cook time. Enjoy! Laura, I’m so so happy to hear how much you enjoyed the recipe. Thank you for sharing! It means a lot.